This morning I was ready to tackle the disaster formally known as the v-berth. I had closed it off by closing the curtain and calling it our “garage” rather than v-berth since it had been drenched with condensation and remained cold even though we had been stoking the stove for days. I pulled the sheets and set up the box fan under the foam. Brian connected the fan to our extension cord and positioned the curtain to act as a barrier for the fan to pull air into/under the mattress and push air back out through the cabin. The cabin was warm and dry and we hoped the circulation of air would start to dry the v-berth. We got a tip from Serendipity, actually reading and not just skimming their identical guidebook, that the Hampton Maritime Center has $1.00 showers. This morning, Brian and I headed over to check out the facilities. The docks were packed full with cruisers participating in the Carribean 1500 Rally (all sailing together to the Carribean, complete with weather reports and fancy 2012 Rally flags). Sure enough we found $1.00/day showers. AAAHHHHHHHH! Refreshed, we decided to not spend the entire day showering. We gathered laundry and formulated a grocery list then headed to Serendipity to make a game plan for our day of provisioning. Brian and I knew from consulting our iMap that we could access Food Lion and the Econ-O-Wash Laundromat fairly easily by taking the dinghy to the end of Sunset Creek. And that is just what we did! 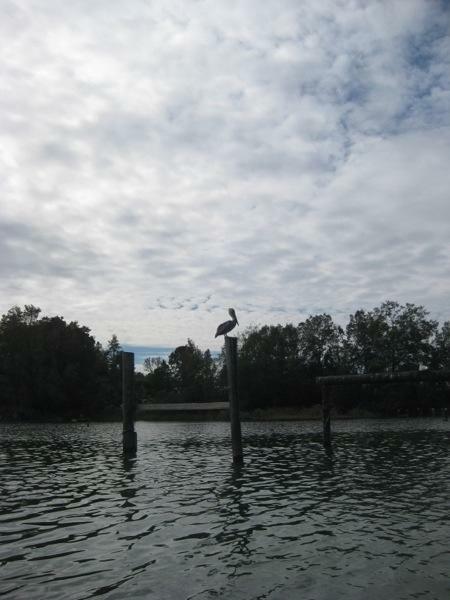 Along the way we spotted pelicans! The walk to the laundromat was only 1/4-mile. This is short by our standards! While carting the full laundry bag Brian and I reminisced about our walk in Rockland, ME that was 2-miles one way to get to laundry/grocery facilities. Sheesh! After laundry we stopped for a bite to eat at a not so great Chinese restaurant on our walk to the Food Lion. Best to not shop for groceries on an empty stomach! At the Food Lion we found good prices, of course getting the membership card for sales, and stocked up for our trip down the Intracoastal Waterway. We dinghied back to our anchorage. From a distance we thought Rode Trip had surely run aground yet again. The previous evening we definitely hit bottom, the depth sounder read 3.5-ft at low tide. Boy had we slept soundly! But as we neared our boats we discovered that we were pointing in the same direction and that Rode Trip was still rocking and turning appropriately. Brian and I made a quick stop back at the Hampton Maritime Center to get ice for our cooler. Then while I unpacked groceries and put away laundry, Brian filled our stove diesel and filled the engine diesel tank from the jerry cans. We had to be ready to leave tomorrow morning. So we dinghied over to Blue Water Yachting Center to refuel the jerry cans with diesel and gasoline. We knew our friends, Por Dos, were docked at Blue Water Yachting Center so after fueling we stopped to see if anyone was home. Brian and I had a great visit with Mark, Marta, Roan, and Alec aboard Por Dos. 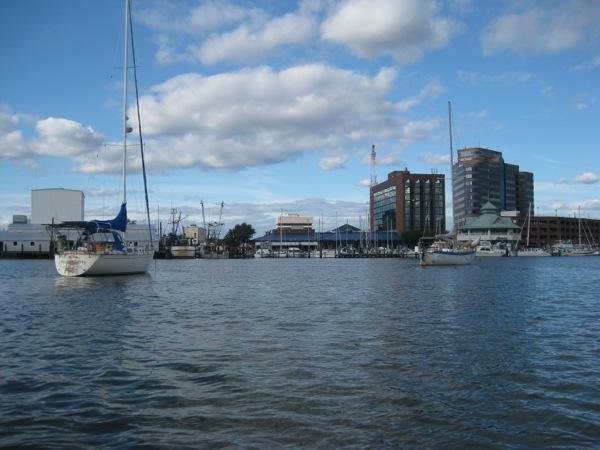 They are planning to leave Hampton Roads and sail directly to the Bahamas along with the Salty Dog Rally. Roan and Alec showed us their Halloween costumes, headless ghost and Captain Ron, as they prepared to make a second round of trick-or-treating at the docks. We chatted for quite a while with Mark and Marta before heading back home. We’re prepared for another 7:30am departure to get ourselves into the Intracoastal Waterway. We’ll buddy once again with Serendipity. Matt and Jess are going to show us the ropes of traversing locks. We’ll be heading through the Dismal Swamp, which has received good reviews from fellow cruisers. Adventure awaits! Just bought a copy of Robert Perry’s book. There is good discussion on your boat and he says he thinks the mast is too far aft..I wondered if that caused a lot of weather helm? I’m sure you had some dicey moments in the storm…however, I think you came through it better than my apartment and house sheltered pals in Manhattan and Connecticut. Your careful planning saved the day. I’m really enjoying following your trip. Fair winds and following seas…. I’m glad that there is a good discussion on the Westsail! It seems that every boat is a little bit of a compromise, but we think that Rode Trip is perfect for what we are trying to do. The Westsail is a true cutter rig, so the mast is very far aft. Rode Trip balances better when we have the first reef in the mainsail. Some owners have gone as far as shortening the boom and decreasing the size of the main. We haven’t done anything that involved, but with some attention to sail trim and an early reef in the main, just before 15 knots the weather helm is quite manageable.